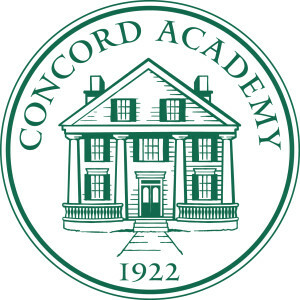 Concord Academy’s logo depicts Haines House, the first building that comprised CA, one that has housed classrooms, a dining hall, and residences throughout its long and storied history. The current version seal is an updated version of the seal this school used on its earliest diplomas and admissions pamphlets. The history behind Haines House is deeply woven into the history of the town. It began as part of a large farm in the mid 1740s until it was purchased by Joshia Davis in the early 1800’s who built a store on its location. A subsequent owner, Samuel Hoar, served on both the Supreme Court of the United States and in the Massachusetts House of Representatives. In 1922, the property was bought by the founders of the present Concord Academy (it had been the site of two schools before the present one). It was renamed for Pamelia Haines, a housemother and director of maintenance. Today, the house stands in its same location on Main Street and is a house for students with two apartments.